Servicing your Peugeot regularly undoubtedly helps to avoid any mechanical problems and keeps the resale value of your vehicle higher than if it didn't have a service history. But don't be mistaken into thinking that you have to go to a Peugeot dealer to get great quality Peugeot servicing in Bradford. At Drive in Service Centre in Shipley we’re proper Peugeot fanatics - we know them inside out. So stop paying main dealer prices when we can provide the same quality parts, repairs and service at a fraction of the cost. Well, nearly. You’ll find that our prices can be 60% less – and that’s a huge saving. Why? Well, we don’t share the same overheads that main dealers do, and our low overheads means we can offer really low prices. Your car will run brilliantly! Best of all, you’ll save a fortune! 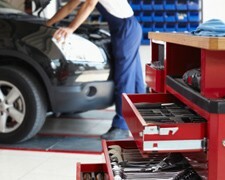 Thanks to Block Exemption, a government ruling which allows you to choose where to service your car without threatening the validity of the manufacturer’s warranty in any way, you can look elsewhere. You should call us. We’d like to think that there’s nowhere better in Bradford or Shipley to service or repair your Peugeot and, once you've discovered our prices, we think you’ll agree.